It is starting to feel like spring around here and we are loving it! It was such a beautiful day today and it got into the 70s. We spent most of our day outside enjoying the nice weather. It is such a relief to start being able to go outside when you have been in hibernation for the winter. I love spring desserts. Carrot cake is one of my favorites and I could eat it year round. Any dessert that you can sneak a vegetable into it and still be yummy is awesome. So because it has a vegetable in it, it has to be somewhat healthy right!? 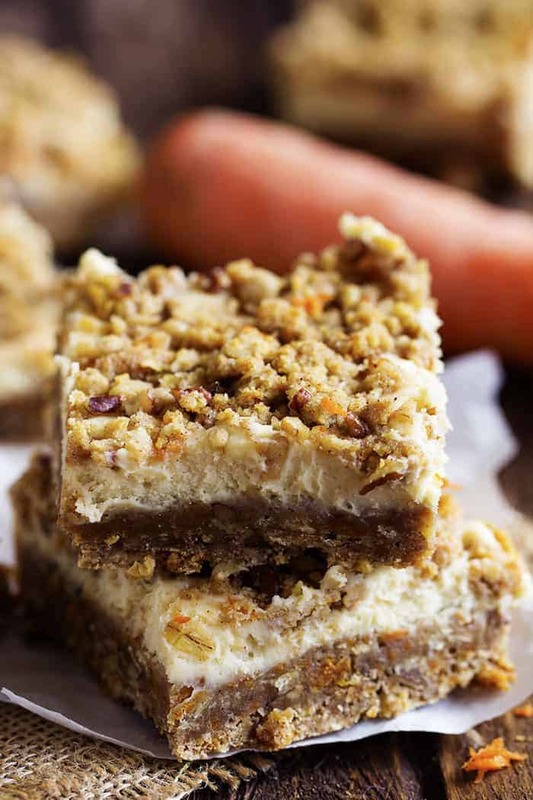 Carrot cake and cheesecake go so perfectly together. 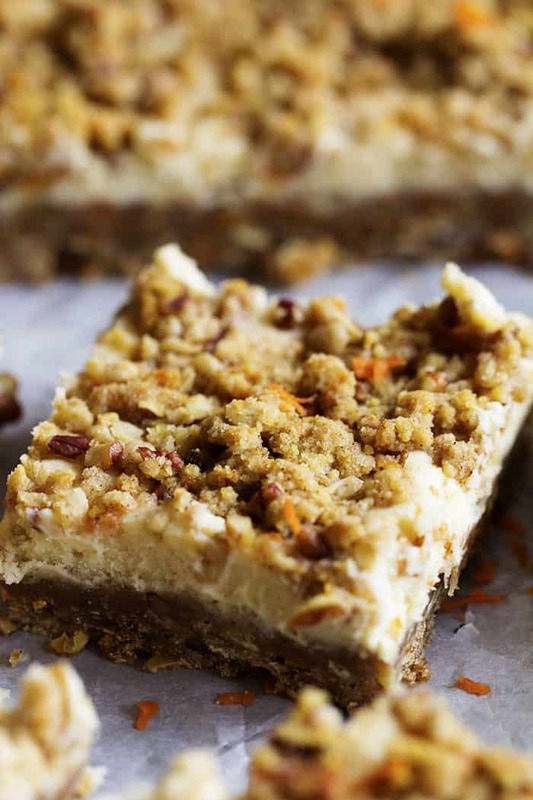 The spices in the carrot cake and the sweetness of the creamy cheesecake center is to die for. It was amazing together in this crumbly delicious bar! I love how the shredded carrots gives the bar a unique texture. Everything came together so well in this dessert. 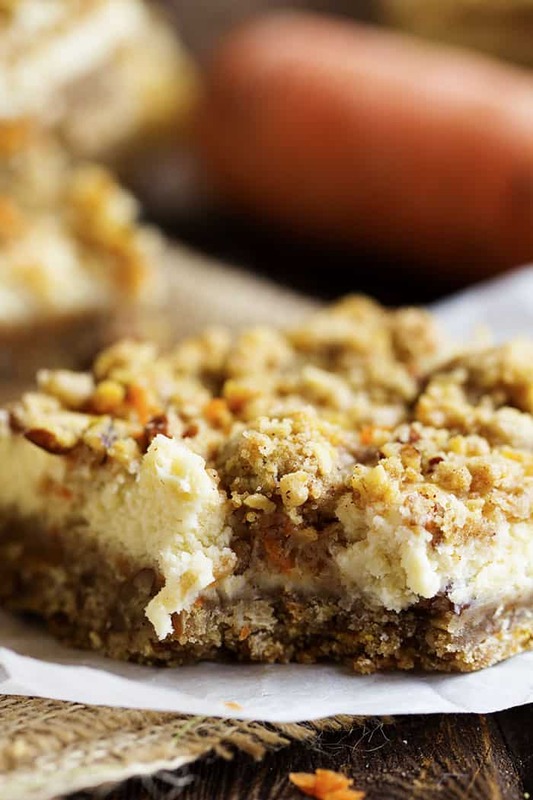 From the bottom of the moist and buttery crust, to the cheesecake center, to the crumbly carrot cake topping, you are going to love this dessert! Preheat oven to 350 degrees. Line a 9x13 inch pan with aluminum foil and spray with cooking spray. Set aside. In a bowl of a stand mixer, combine flour, old fashioned oats, brown sugar, sugar, baking soda, cinnamon, allspice, and nutmeg. Add the softened butter. Using the paddle attachment, mix until it resembles a coarse meal texture. Sprinkle in vanilla and blend. Stir in carrots and chopped pecans. Reserve 2 cups of the crumb mixture and press the rest in the bottom of your 9x13 inch pan. Bake for 20 minutes. To make the cheesecake layer: While the crust is baking, beat together the cream cheese and sugar until smooth. Add the eggs one by one until smooth and lastly add the vanilla. Once the crust is done baking, spread the cheesecake mixture over the top of the warm crust. Top with remaining crumbs and bake for an additional 25-30 minutes or until the top is golden brown and the cheesecake layer is set. Let cool completely and refrigerate for at least 3 hours for easier cutting. Is that two 8 oz pks of cream cheese? It doesn’t give the measurement. This sounds delish but I think I’ll try it with chevre instead of cream cheese to lower the sodium and kick up the flavor just a bit. Love your blog and all your great recipes. Can you tell me is this a 8 or 16 oz size of cream cheese, each? Mmm! I think I’m going to have to bake these up for my sister in law, she loves carrot cake everything! What size of cream cheese? would like to make them. Hi – looks delicious. Do they have to remain refrigerated until ready to serve? These are in the oven and smell incredible!! Do you refrigerate until serving? Yes, of course! You will just want to make sure that you do not over beat it. Enjoy your cake! is it icing sugar in cream cheese filling or just white sugar?